New research based on interviews and surveys including participants from diverse nationalities lends support to the theory that humans experience emotions within our bodies in universal ways. In other words, a chest swelling with pride or a head-to-toe romantic tingling are bodily experiences common across cultures. 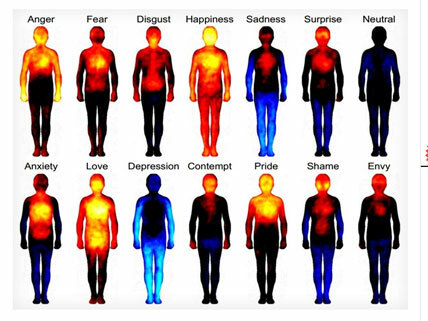 The scientists involved have creatively demonstrated their findings through “heat maps” of human figures and thereby created a sort of “atlas” of the Body Emotional. Their study was published in the Proceedings of the National Academy of Sciences. Finnish researchers surveyed nearly 800 men and women from Finland, Sweden, and Taiwan. Participants were shown text and visuals depicting emotionally charged states and were directed to respond by coloring on human silhouettes the areas of their own body that they felt decreasing or increasing activity—using a spectrum from red for intensity to blue for dullness. The words, stories, movie clips, images of facial expressions, and so on were selected for being representative of various emotions, such as shame, disgust, depression, anxiety, love, or fear. The actual measurable influences on our physiology, such as a rise in skin temperature or heart rate, that are exerted by emotions are minimal; however, the sensations are, according to this new research, consistent regardless of one’s cultural or geographical background. One conclusion of this research is that there are biological, rather than a cultural or linguistic, explanations for the responses we feel physically when we experience specific emotions. This article reviews the new findings about how our bodies process emotions. This website of the Arvid Kappas working group presents basic psychological perspectives on our current understanding of emotions; includes pages on psychophysiology, which encompasses bodily changes related to emotions. What does the black signify? Is it neutral, or just unrecorded?